I’ve had a good week in the kitchen. I still try to make as much as I can from scratch – with a few cheats – but some days/weeks I feel like I just don’t have any mojo. This week however has been a good week. It makes me happy when I manage to feed the 3 of us fairly decent home cooked food, and makes the treats feel a bit better too. Breakfast is usually toast or cereal or a croissant at the weekend. Lunch during the week tends to be sandwiches and soup or leftovers. At the weekend we usually have things like baked potatoes and beans, omelette, selections of wee picky bits (ham, cheese, carrot sticks, sweetcorn, crackers etc) or sometimes brunch – sausages and poached eggs. It depends what we have on and what is in the house. The wee one is fed at nursery Wednesday – Friday so I tend to cook slightly spicier or complicated things on those days. These little rolls might not be the prettiest but they are great for picnics and now that the weather is getting a bit cooler I think they would be perfect dunked into some nice soup. I have a pot of leek and carrot soup ready at home for lunches this week. They are very versatile as well, I think next time I might try them with some sweet flavours for a breakfast treat. I confess I have a breadmaker! 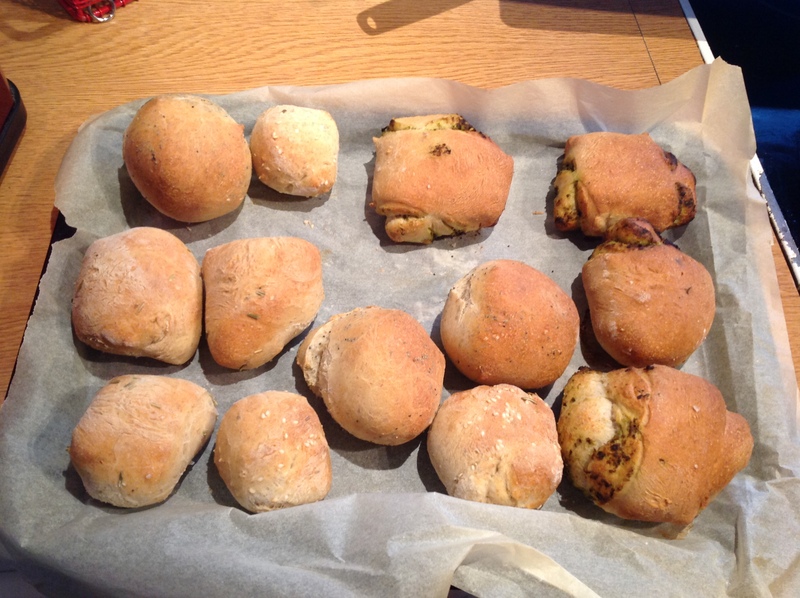 So whilst I did bake these rolls myself I did the first knead in the breadmaker… just to save a little time. Place the flour & salt into a mixing bowl. Mix the yeast, sugar, water and oil in a jug. Add the liquid to the dry ingredients and mix together until it forms a dough and comes away from the bowl. For this you need to use your hands. Transfer the dough to a floured work surface and knead for 5 – 10 minutes. As my chef cousin once told me ‘Bread Kneads Love’. Pop the dough back into the bowl and cover with cling film. Leave it for 30-40 minutes in a warm place. Switch the oven on to 200c to preheat . Give the dough another light knead on the floured surface and then divide up equally into how many ‘flavours’ of rolls you are making. I went with 4 types. So I got each lump of dough, stretched it out a little then sprinkled my flavour over, eg. Sesame seeds. Then I roll it up and repeat, kneading lightly until the seeds/basil are distributed evenly. I then cut the dough into roll sizes, shape a little the place on a parchment lined baking tray. For the pesto or if you were using a spread (I think something like lemon curd or Nutella would be yum) I stretched the dough out until a rough rectangle, then rolled up the dough like a swiss roll then cut into smaller rolls. Bake for 20 minutes until golden on top and hollow sounding when tapped on their bottoms. Gosh time flies… we are nearly at the end of summer, I’ve had a busy couple of weeks, catching up with good friends, work and unfortunately a family bereavement but I have a few posts lined up so my blog will become lively once more. The madness is about to start. Note this section will be library related, scroll down to get to the tasty recipe! I work in an FE College, the teaching staff have just returned from their summer break, my to do list has grown rapidly and the students are set to return on the 1st of September. It will be chaos and madness and I will be working 42 hour weeks until Mid-October, but the truth is that this part of the academic year is actually my favourite time. I love getting to meet the new students; I remember the feelings of optimism, enthusiasm and nerves of my first few weeks of post-school student life. I also get to ‘teach’ the students about the library and some basics that will help them as they begin their studies. As a former EFL teacher I actually love the induction sessions where my teacher and librarian skills fuse together. I get to meet the students in small groups and my ultimate aim is that they leave the session feeling that they can come to us in the library for support and help… actually remembering how to use the catalogue can wait as long as they feel that they come and ask. Often students are nervous to ask their tutors as they think they will be judged for not already knowing, they don’t want to ask classmates for fear of looking stupid but here in the library we do not judge we just help. Often that is reassuring them that the tutors 100% will not mind being asked. I think as a student especially at the beginning you are so nervous and really lack in confidence, here in the library we aim to be the friendly people who quietly support you and encourage. Often in life we assume people are really confident and capable but underneath we all have the same worries about whether we are doing as well as we can or doubting our abilities. So trying to be friendly and no-judgemental and making assumptions is something I actively try to avoid and when I do I try to remind myself that we never really know what is whizzing through another persons head. Now I am getting onto the Foodie stuff…. I am soon going to working very long days 2 days a week so I will need to cook a bit more at weekends and feed my freezer with nice meals that are easy to warm up as I know fine well that I won’t be wanting to cook late in the evening and when you are tired it is easy to start relying on potato waffles and chicken nuggets! My recipe this week can be frozen and warmed up. I have made pies but the filling could be a nice casserole dish served with cous cous or salad (if I ate salad) or even nice on it’s own with some crusty bread. However the pies are super tasty and very filling. For a veggie version try swapping the chicken stock for a vegetable stock and adding peppers instead of the gammon. You will need 4 individual pie dishes or 1 large pie dish, a large pot, a masher and a couple of other bits and bobs which are stated later in the recipe. I bought Individual oval pie dishes from Amazon recently which I plan to use for pies, pasta bakes and other things. Good way of some portion control! 4 x large(ish) Sweet Potatoes – cut into small chunks. Sweet potatoes come in all sorts of shapes and sizes, you want to allow for a portion per person, so if you have monster ones then perhaps you will only need 2-3. Mustard – 1 teaspoon. I had a hot and smooth mustard but I was planning on using a wholegrain one, so whatever you have available will work fine. Seasoning for the gammon – I used smoked paprika as I had unsmoked gammon steak and felt a bit of smoky flavour would work well with sweetness of the potatoes. I also used a pinch of brown sugar and a teaspoon of a garlic and pepper mix. I love the Organic Blending Company, I always have the Garlic Pepper in my cupboard. Boil the kettle and pre-heat the oven to 180 degrees. Prepare the Sweet potatoes and onion, and then place them in a pot. Add the stock cube and flavour pot, thyme and seasoning. Remember the stock cube will have salt so very little salt is needed. Add the hot water so it just about covers the mixture, you don’t want to add too much water at the beginning as the water will be absorbed by the mixture to become the ‘juice’ for the pie, so if you add too much you will have a watery pie. Cover with a lid and simmer the mixture on a low heat until the water has been absorbed and the potatoes are soft and cooked through. Once the potatoes have cooked use a masher to lightly mash up the mixture. You don’t want it to be smooth but rather a thick consistency with no large chunks of potatoes. Leave the lid on to allow the mixture to absorb more liquid whilst you prepare the gammon. Place the Gammon steaks into a deep oven dish – during cooking the gammon with create a tasty ‘juice’ some of which will be added to your pie for extra flavour later. Season the gammon with the herbs/spices you have chosen and the little sugar. If you aren’t sure what herbs you would like, have a look at the ingredients of the flavour pot and use that as inspiration. I wanted some seasoning to add a smoky, savoury flavour to balance out the sweetness of the potatoes, hence smoked paprika and my garlic and pepper mix. Cover in tinfoil and cook in the oven for 20-25 minutes (depending on the thickness of the meet) until just cooked. We want the meat to be as juicy as possible so watch not to over-cook. Once cooked cut up the gammon (I find using scissors I keep for the kitchen easiest) and add to the sweet potato mixture. Add a spoonful of the ‘juice’ from the oven dish to the mixture for extra flavour as well. Give it a good stir, add the cheese, then stir again. Taste and add more seasoning if required. Now you have a choice. You can use this tasty mixture as meal on it’s own, freeze for later or use as pie filling. I’m going to turn it into pie so for this fill your pie dish or dishes with the mixture until nearly at the top and then prepare the pastry. .
Get your pastry and roll out onto a lightly floured surface. Add a pinch of thyme (and cheese for extra flavour if you wish). Fold over the pastry and roll out again. You want the pastry to be ½ cm thick. Cut a 1 cm wide strip and use that to cover the edge or you pie dish or dishes. This will give your lid something to grip onto. Using a brush lightly cover this pastry edge with a little beaten egg. Then get a large piece of pastry, cover the dish, cut away the excess and use a fork to press the edge and lid together. Brush the top of the pie with egg to give the pie a nice finish (I have a friend who is allergic to egg when she is visiting I would use just a little milk for this part instead of egg). If you have excess pastry then use it to decorate the top, and brush it with egg. 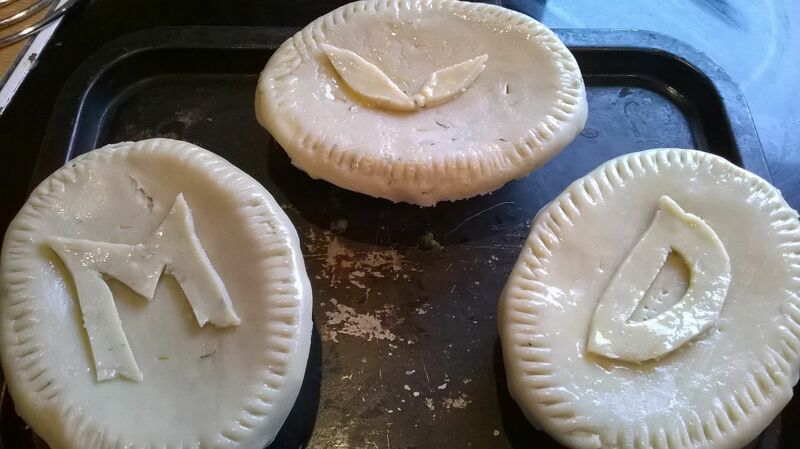 Using the point of a sharp knife make 2 small piercings into the top of each pie to let steam out whilst it is cooking. I advise placing the pie dish on a baking try to make getting it out the oven easier, cook at 180 for around 30 minutes until the Pie is golden and delicious looking. If you are worried about the pastry browning too quickly, lower the temperature. Eat the tasty pie. You will be very full afterwards. So today I am going to share one of my never fail recipes: Chocolate Brownies. Chocolate Brownies are always popular. I suggest that if you are going on a picnic then you make them the night before then you must test one warm out the oven with ice cream. – yum yum yum. The rest once cooled are great little picnic treats, or great to bribe work colleagues into liking you. Or just making friends in general! Melt the chocolate with the butter over a pan of simmering water. Meanwhile switch the oven on to warm up, 190c Gas mark 5. Whisk the eggs and sugar together until the mixture is pale and creamy. Add the vanilla essence and stir in the melted chocolate into the egg mixture. Grease a tin. I suggest a 20cm square tin. Line the tin with baking paper. Our the brownie mixture into the tin and smooth so it is roughly even, remember the corners. Bake in the oven for around 25 minutes until the brownies are firm on top and a skewer into the centre comes clean. I like my brownies slightly gooey but if you like them firm leave them a bit longer, but keep an eye on them so the don’t burn. Leave to cool in the tin for 5 minutes before cutting into pieces – the size is up to you! I don’t have a photo, by the time I remember they have all been eaten. Oops! I don’t have much more to post today as it is way too hot for my brain cells to work. I long to be by a pool with an icy drink, alas I’ve spent all week in front of a computer and my eyes hurt, my brain is sweltered and once again the sun is supposed to go over the weekend when I’m off to enjoy it, typical! When the sun is shining I tend to crave lighter foods. Picnic teas with a variety of cold meats, cheeses, nuts (pistachio or cashew are my favourites), crusty bread and pesto are ideal but after nearly 2 weeks away the Boyo was craving some slightly more traditional food. We had such amazing food when we were away in Hong Kong, so full of flavour and the variety of food you can get over there is phenomenal. A week home and I definitely feel like we should pop (haha ‘pop’ doesn’t really apply to a 24 hour journey!) over this weekend and get some Thai food this weekend, well a girl can wish! I wanted to make a roast because it usually results in at least a couple of meals worth. I didn’t feel like cooking beef or lamb and instead decided to make roast chicken. To zing up my chicken and make it a little summery I made a paste to both stuff and baste it with. I used butter, a squirt of fresh lemon juice, juice of half a lime, fresh coriander, some chicken season all, and a few drops of Heinz Tangy Jalepono sauce. I whizzed all of this up in a blender until it was a nice thick paste then using a sharp knife to make a little opening I stuffed inbetween the skin and the flesh with the paste then smothered the chicken in the rest. Whilst cooking I scooped the liquid from bottom of the roasting dish to pour over the chicken. The result is a nice tasty juicy roast chicken. We had ours with some steamed veg and potatoes. I also made a gravy, enriching it with some of the juice from the roast and fresh coriander. Now the great thing about roasting a chicken is that it can go quite far. So I shredded up the leftover chicken and this time marinaded in some spices and soy sauce to have with stir fry noodles the next evening. I also used the carcass to make tasty chicken stock. For this I had a root around to see what veg I already had, this time, 2 small carrots, 2 sticks of celery adn an onion. I roughly chopped the veg into large chucks and put this along with the carcass into my slow cooker. I covered with hot water, added some black pepper and a little bit of thyme and let this cook for 12 hours overnight. The next morning I awoke to very tasty smelling stock which is now in little pots in my freezer ready for more meals. Other foodie finds this week have been the delicious Laimon Fresh juice. We found it when we were out wandering the Fife coast at the weekend. If you are in the area then the Elie Deli is definitely worth checking out. I even liked it more than the ice cream I was eating which is syaing something for me! I just have to find a stockist closer to home. It is a wonderful fresh drink, it tasted a bit like a mojito but tastier. Really perfect for the summer. I might even have to order online if I can’t find it nearby. Tonights tea will be burgers with halloumi, spicy tomato rice and roasted pepper. I just pan fry the halloumi for a couple of minutes and find it goes perfectly with the meaty burgers and the rice. For the rice I cook the rice in stock, passata and add garlic, Nandos Piri Piri sauce and black pepper. The trick is to cook it at a low heat slowly so it doesn’t stick and it is very tasty. I usually add some chorizo to the leftover rice for another slightly lighter meal. I am sorry I don’t have any photos this time, my phone really is a bit decrepit now and there is something wrong with my camera – I’ll try and get my technology sorted out asap! The Hong Kong guide will likely be up on Monday and it will be photo heavy! You have been warned! Another fishy Friday – sorry to those who aren’t fans of fish! I am trying as I have mentioned before to become a healthier person and one of the things I am trying to do is to eat more fish. As a child the only fish I ever ate was haddock in breadcrumbs or ‘yellow fish’ made by my Granny. Yellow fish is smoked haddock baked in milk and butter – hence the name yellow – and the fillet was served with the wonderful buttery sauce and a slice of bread and butter. Delicious! So I really feel that I need to expand my menu where fish is concerned. So today’s meal is Smoked River Cobbler with roasted herby potatoes and courgettes with a herby white sauce. On another note regarding my food eating I am embarking on a whole new daunting challenge. I am what is known as a ‘picky eater’. Over the past few years I have become much more adventurous (I only tried curry when studying for my postgrad. Thank you to my friend from Bristol for introducing me to this wonder, I will forever be thankful). Living in China and Hong Kong forced me to try some new and exotic foods and developing a serious cooking hobby over the past two years (and having a boyo who is willing to try EVERYTHING) has meant that slowly but surely I am eating a much wider variety of food. I don’t eat vegetables or fruit. I’ve had a major problem with fruit & veg for as long as I can remember. I am happy to eat a wide variety of vegetables in soup format as long as they are blended. I will cook with vegetables and enjoy the flavour they give to my meals – but I pick all the actual vegetables out. I literally gag and can’t swallow when I feel the texture of vegetables in my mouth. As for fruit, I don’t even go near it. The closest I will get is a puff pastry apple puff thing where the apple inside is basically pureed and the whole thing is covered in custard. This my friends (if anyone reads my ramblings) is ridiculous. I enjoy cooking, I love looking at all the wonderful variety of food, I want to be able to cook and eat away to my hearts content. I want to give up my sugar crazy tendencies. In the past I didn’t mind so much but now that I enjoy cooking so much I am seeing so many tasty things that I am missing out on. Another big factor is my Boyo. I’m not just responsible for myself now – don’t worry he can look after himself- Boyo and I decided to live together, one day we hope to start a family together and we intend to spend our lives together (we aren’t married but the same objectives really!). I worry about him and want to look after him and he does the same for me. Although I am trying to improve my health I can’t really claim to be healthy unless I eat a balanced diet. I am 30 later this year. The question of us starting a family gets closer and bigger all the time, how can I grow a little person if I am not properly nourished and how can I raise a child if I do not try to be healthy and show good behaviours to them? It is important to me and it is important to the Boyo. So I hear you ask what am I doing about it? Well I am trying to improve what I eat all the time – sneaking spinach into curry, using more wholesome ingredients, varying our carbs – cous cous, rice, pasta, potatoes and limiting our portion size of carbs and instead of having massive meals I am trying to just use sensible portions. I am also trying to reduce my dairy intake by eating less cheese, just the equivalent of 1 glass of milk a day and a yoghurt, I try to eat no more than 2 slices of bread a day and I make my own bread (I try to make nearly everything from scratch) and I only drink fizzy drinks if we are out for a meal or at the weekend and still not a crazy amount. I’m trying to up my peppermint tea consumption, experiment with green tea and drink more water. I’ll update you on my healthy eating quest soon. 1. Put your oven on to warm up, I had mine at 200c. Put a good glug of the olive oil into a large roasting dish. I used a large oval le creuset one but I also have a big glass one that is ideal for roasting the potatoes. Place the dish with the olive oil into the oven to warm up whilst you peel & chop the potatoes and slice up the courgettes. 2. On the chopping board mix up your courgettes and potatoes using your hands then cover in the seasoning and a good sprinkle of sea salt and a little black pepper. Mix up again so all the potatoes and veg are covered in the herbs and spices. 3. Lift the now hot dish out the oven and put your potato and veg mix in. Give a good mix then put in the oven. Depending on the size of your potatoes and how well spread out they are in the dish it could take between 30 – 40 minutes for them to cook. Every so often you want to lift them out and give them a good mix so all the sides turn golden and a little crispy. 4. Now to prepare the fish. Place them in another roasting dish. Sprinkle your seasoning over them and gently rub it in. Sprinkle a little dash of olive oil over the fillets and cover in tin foil. The fillets will cook in the oven in 20 minutes so time putting them in on how your potatoes are looking. 5. The sauce isn’t necessary but adds a little more flavour to the dish. Put the milk and butter in a pot and place over a medium heat on the hob. When the butter has melted add the flavour pot and mix thoroughly. Add the crème fraiche and Philadelphia. Keep mixing until it starts to resemble a nice consistency, add the garlic, parmesan and a little black pepper. If you have the sauce ready before the rest of the meal just leave it off the heat to warm up again when you are ready to serve. If it is a little thick then just add splashes of milk whilst stirring until the desired consistency is reached. 6. Check to see if your potatoes are cooked through by cutting one in half and eating it! If they are cooked then you are all ready to go and serve it up. Enjoy!